Model Airplane International isn’t one of the magazines that I buy every issue of. Jim Bates and I have had a number of discussions over which modeling magazine, SAM, SAMI, MAI, etc. is the best. All seem to have their faults, with none of them rising to the level of the old SAM or MAM before it eliminated modeling content. This latest issue of MAI is a good, if not great one. The feature articles are on construction of a 48th scale MC.200 and a 32nd scale F6F. Obviously, neither is of great interest to the 72nd scale modeler. There is a build of the new AZ Spitfire Mk IIa and a very nice in-depth conversion article on converting the Airfix Nimrod to the AEW.3 configuration. This article is a good one and does a nice job documenting the conversion as well as all the faults of the original Airfix kit. The historical article covers the Sea Venom. Not exactly my cup of tea. There are a number of nice side view illustrations of different versions of this aircraft. As I said, all in all, a good issue, if not a great one. This is the latest MAI. I don’t buy every issue of MAI, and frankly, looking back I am not sure why I got this issue. It isn;t anything special. It has a nice build review of the Airfix Sea Harrier FRS1 and FA2 in 72nd scale. The feature historical article is on the Fairey Flycatcher. It is a nice article, but not a plane I am particularly interested in. There is a nice build review of the new Me-109F in 32nd scale by Hasegawa, if you are into that weird scale. As you can see I am working my way thru my backlog of modeling magazines to review. This issue is dated December 2009, which means I probably got it sometime in January, and its taken me till now to actually review it. It is your typical Model Airplane International. (MAI) This issue has a feature on the 32nd scale Hasegawa Ki-44. For 72nd scale modelers, the only thing of real interest is the quick build/review of the Airfix Spitfire PR XIX, which has been reviewed extensively in any number of modeling magazines. This issue also has an article on the PV-1 with several pages of color illustrations. It also has a short history of the Czech manufacturer, MPM. All in all, even though I like the monthly list of new releases and the list of coming releases, I’d say this issue wasn’t worth the money for the 72nd scale enthusiast. I think I have mentioned previously that I don’t buy every issue of this magazine. Given how much I enjoy it, I am not sure why. This issue was a good one, especially for the 72nd scale modeler. The issue has a nice quick build of the Dragon Ar-234P fantasy night-fighter version of the Ar-234C. I am not much for Luft’46 and I think this particular version of this aircraft is ugly, but it is a nice build of the kit with helpful info. One of the feature articles is on the 72nd scale Airfix Shorts Tucano. This is an excellent article of a very nice build. The author/builder did a nice job of detailing the kit, and the results are amazing. This article alone would be worth the price of the issue. The history feature article is on the D.H. Vampire. It has some nice color profiles with the article. Not my favorite aircraft, but it is a nice article and there are a couple of 72nd scale kits have been made of this aircraft. The magazine also has the usual collection of kit, decal and detail parts reviews with many new items in 72nd scale. A good issue. 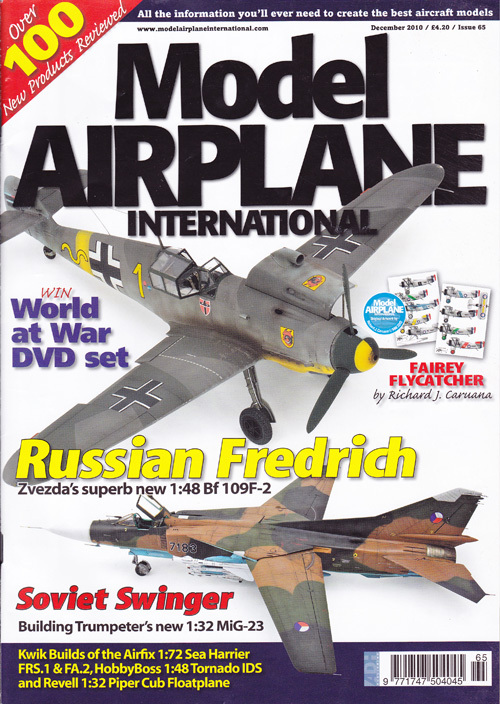 Model Airplane International is the aircraft modeling magazine that I don’t buy regularly. Its new kit listing and coming soon listing are very helpful. The layout is attractive and easy to read. I am not sure why I don’t buy this magazine regularly, but I don’t. This issue has several things for the 72nd scale modeler. It has a very nice review of the DML He-219B. It also has a quick build article on the Special Hobby P-40F. Most of the issue is taken up with a build of the new 32nd scale Revell Ju-88A. It does however have a feature build of the Academy Me-262. I’ve heard some criticism of the nose profile of this kit, but the builder/author makes no mention of it. Finally, the aircraft featured in the history article is the French Dewoitine D.520. This has a very nice brief history of the type as well as numerous photos and a number of side view color illustrations of its use by various air forces. All in all this was a good issue that made me wonder why I don’t get this magazine more often.